Volvo Penta is offering factory-built keel-cooled engines for the line of marine commercial inboard and sterndrive D4 3.7-liter and D6 5.5-liter engines. 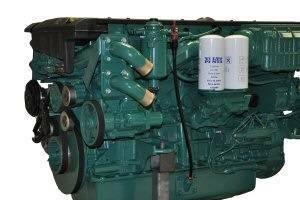 Volvo Penta is offering factory-built keel-cooled engines for the entire line of marine commercial inboard and sterndrive D4 3.7-liter and D6 5.5-liter engines. The D4/D6 keel-cooled version uses a twin circuit design, with keel coolers for both the high-temperature engine block circuit and low-temperature charge air cooler circuit.